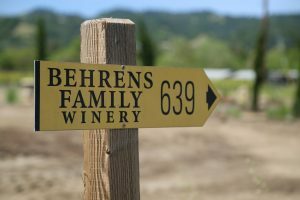 Behrens Family Winery (formerly Behrens & Hitchcock) is located on the top of the Spring Mountain district near the Sonoma County line. 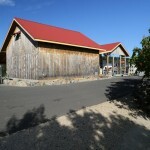 It is located at the end of this district’s infamous “summit wine road” which leads off the very windy Spring Mountain Road. 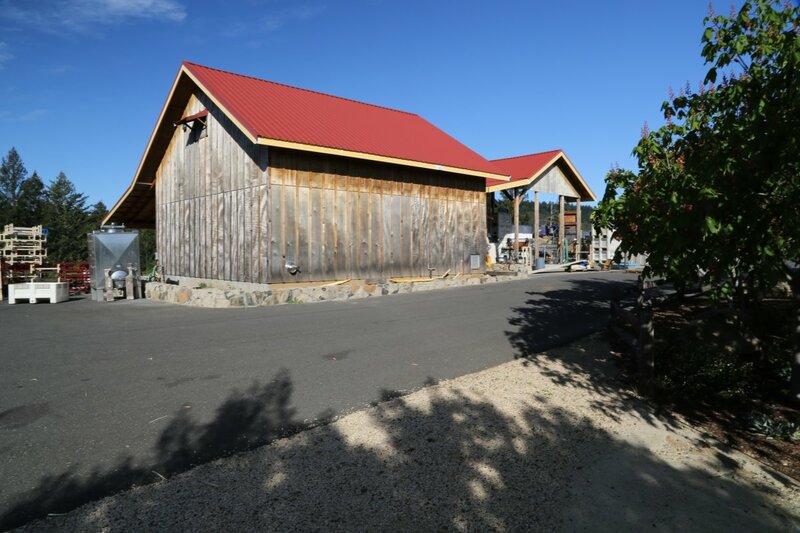 This summit road is home to a number of Spring Mountain wineries. 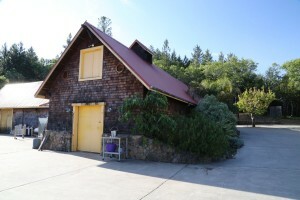 Two couples founded the original winery; Les Behrens and Lisa Drinkward along with Bob and Lily Hitchcock. 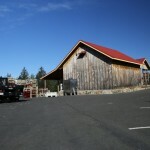 Les and Lisa met in Arcata, California (near the city of Eureka) – married and then started a restaurant in 1991 – also in Arcata, called Folie Douce. 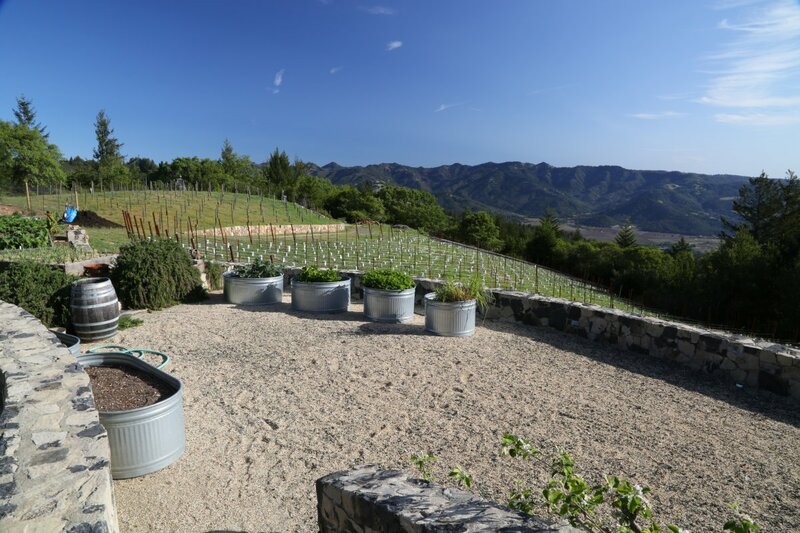 They built up a premium wine selection which ultimately earned them the Wine Spectator Award of Excellence. 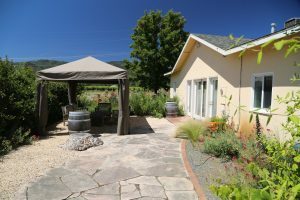 Eventually Les decided to make home wine – but then soon started making limited quantities of commercial wine from premium grape sources in the Napa Valley. 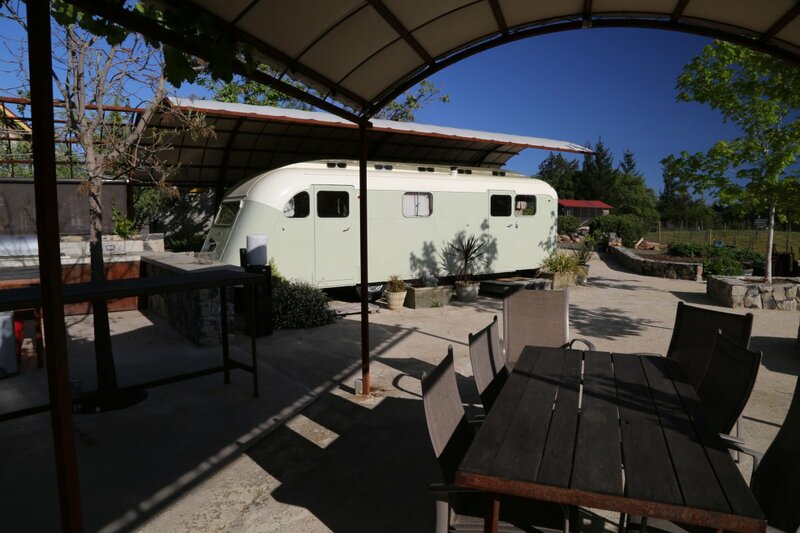 For several years Les make the arduous 11 hour round trip drive from Arcata to Napa to pickup the grapes and drive them back to the north part of the state. Eventually Les and Lisa sold Folie Douce Restaurant (it is still in business by the way) and moved to the Napa Valley. They purchased land high on Spring Mountain and soon after Les and his son Sean constructed a small winery. 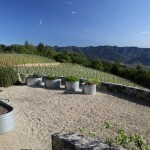 While they still do not own any vineyards – they continue to make their wine here. 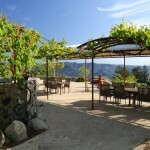 They source from a variety of Napa vineyards up and down the valley (13 at the last count). While never formally trained in wine making – Les has subscribed to the “learn by doing” motto – he has been the primary winemaker for every vintage since 1993. 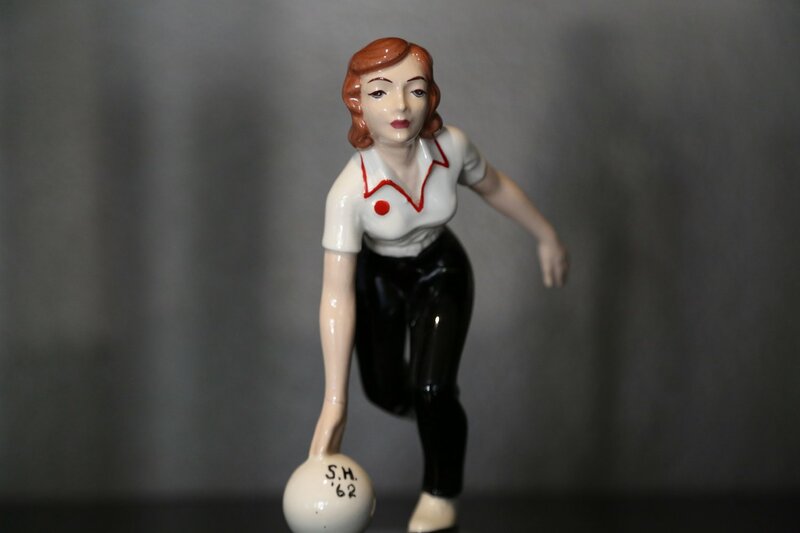 Sometimes in certain industries, regardless of background, when someone is passionate about something they often create something just as good as those who were formally trained in a particular field. Such is the case with Les. 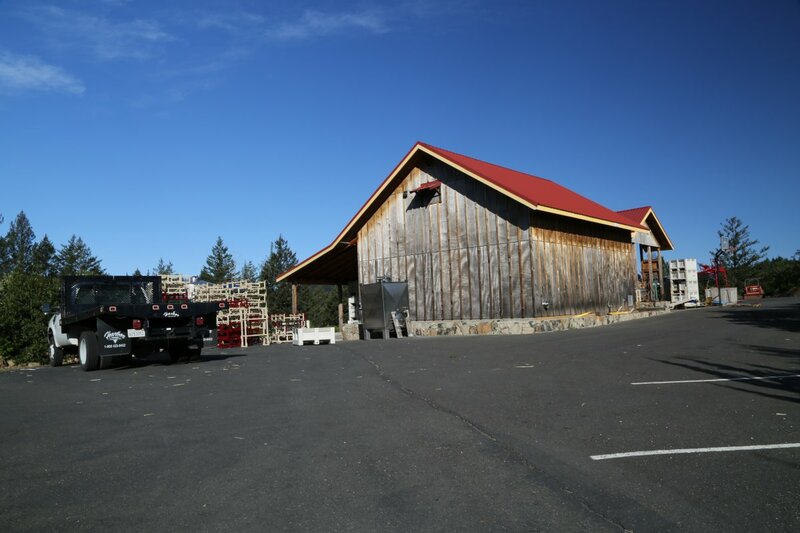 He was a former grave digger, wood worker, turned construction worker turned restaurant owner, turned vintner. 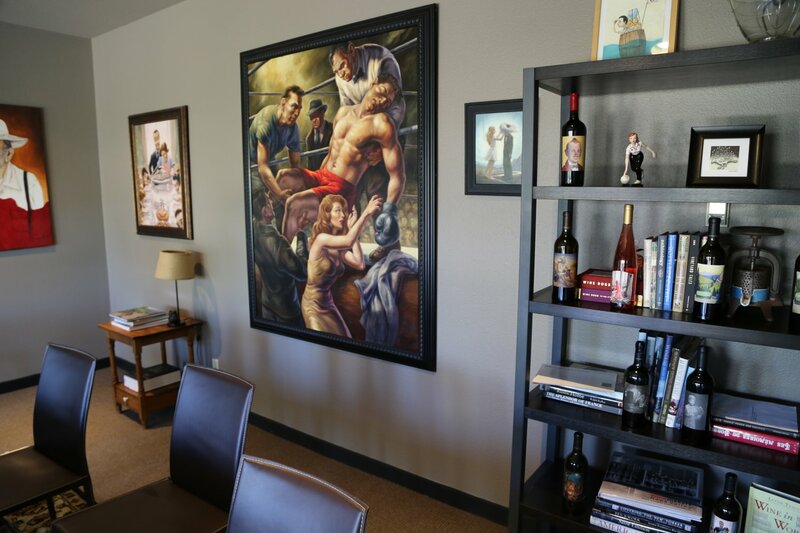 His wines have received exemplary ratings and a loyal following from his customers including from Robert Parker who first wrote about them in 1997 (helping expose their wines to numerous collectors). 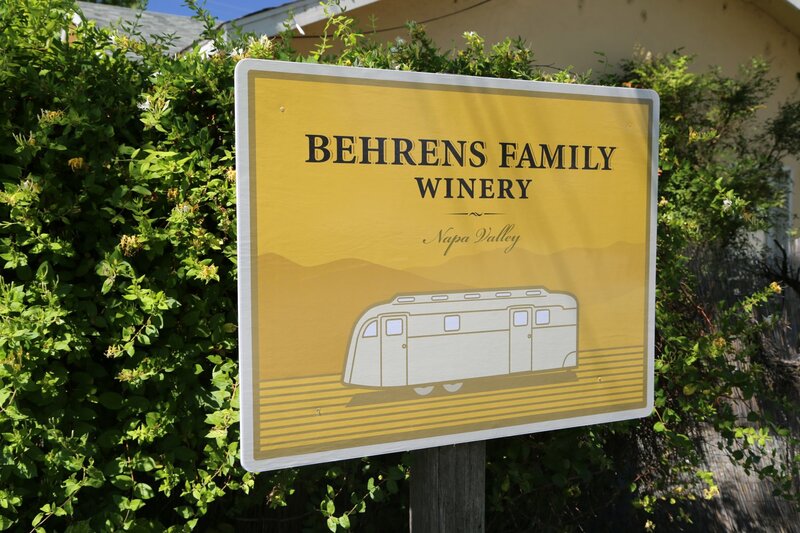 The first vintage of Behrens and Hitchcock was in 1993. The last vintage bottled under the Behrens and Hitchcock label was a 20 year anniversary red blend from 2013. 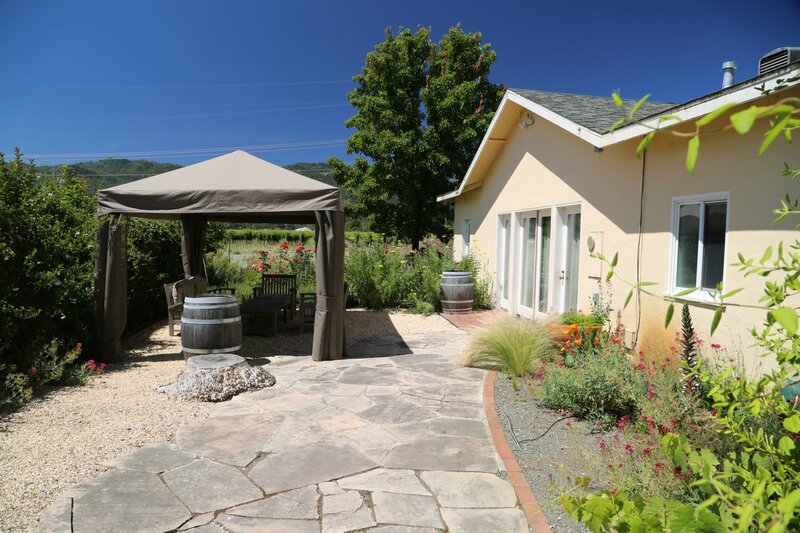 Wine making here involves both family and friends; several other labels have been made at the winery over the years (or are still made at the winery) including Drinkward-Peschon (a partnership between Lisa and winemaker Françoise Peschon), Robert Nenow & Zeitgeist Cellars. 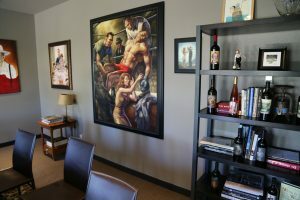 Tasting is appointment only for serious wine enthusiasts and is always kept private for your party. 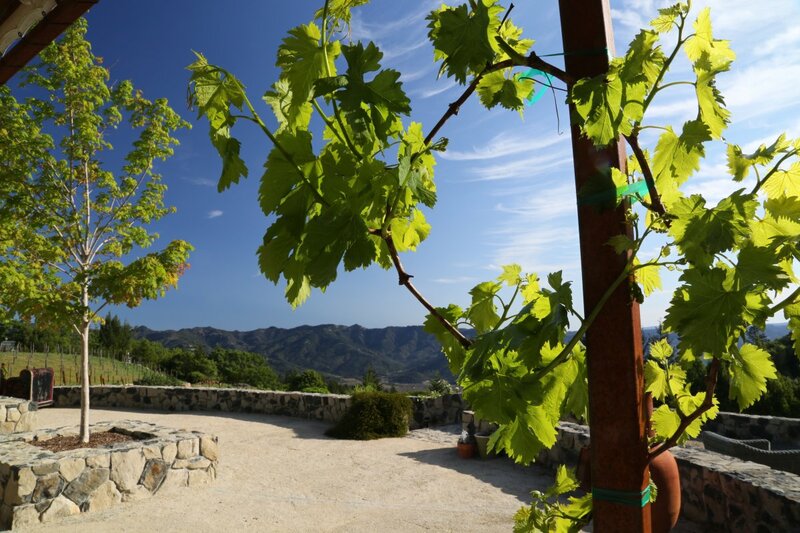 Guests often drool over the fantastic views from the winery overlooking the Vaca Mountains to the east. Their Spare Me is a blend that changes every year – it is a barrel selection of wines that do not fit into their other wines. The very unique label is of a woman bowling based off a statue they purchased on Ebay – two random details on the statue stand out, one are the letters SH (one could take this to mean St. Helena and the year 1962 – the year Lisa was born). The 2013 is dark in the glass with darker fruit aromas including blackberry along with notes of leather and cedar box on the bouquet. A very approachable wine in it’s youth, it is somewhat juicy on the palate with mouth watering acidity. Medium bodied with somewhat dusty fairly well integrated tannins anchor the finish. While they produce some wines year after year – a number of their wines/labels have only been produced for a few vintages. Two wines really stood out from our tasting; the Cemetery and the Family Reserve. 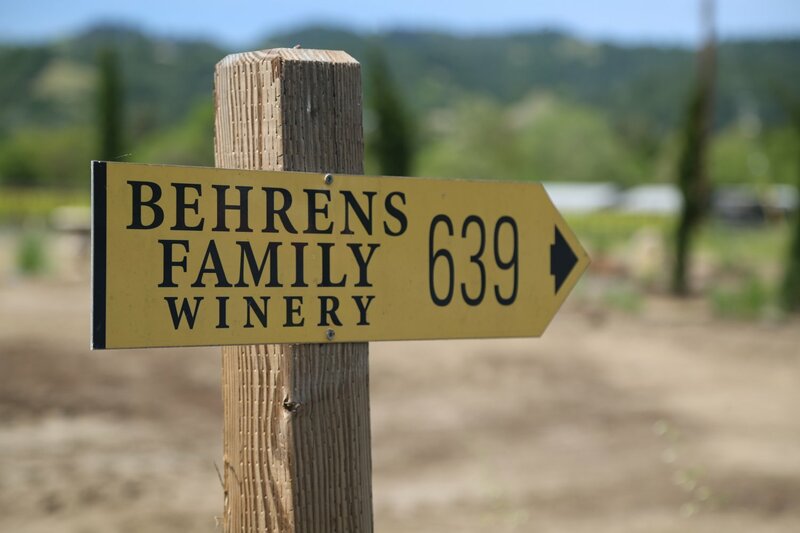 The Cemetery name is interesting for two reasons; Les used to be a gravedigger and the vineyard providing the fruit for this wine backs right up to the St. Helena Cemetery! The label was drawn by the acclaimed artist Rosemary Feit Covey. It is one of the darkest wines you will ever see, is big and is very full bodied. In comparison the Reserve is a totally different wine. It is a blend of four Bordeaux varietals and is only made when they feel the “juice” is of the highest standards. It is a very elegant wine, soft on the palate and smooth on the finish. A visit to the winery incorporates a unique tasting experience to Napa. 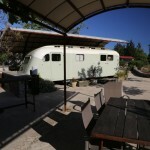 Les and Lisa acquired a 1947 Westcraft trailer which served as their tasting room for a number of years. 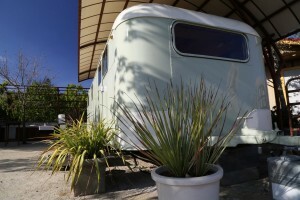 This type of trailer used to be the top of the line at the time. 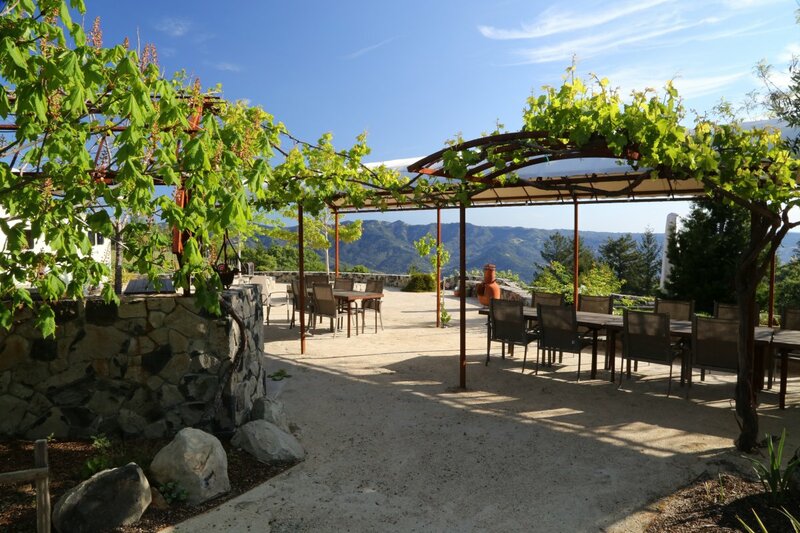 It made for an unusual and intimate Napa tasting experience – one that is perched at the top of the ridge with stellar views of the nearby mountains and valley far below! 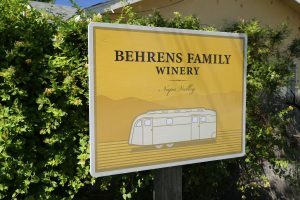 Opting for a more accessible tasting room, Behrens Family Winery now maintains their primary tasting room ‘hidden’ just off of Main Street in the southern part of St. Helena. 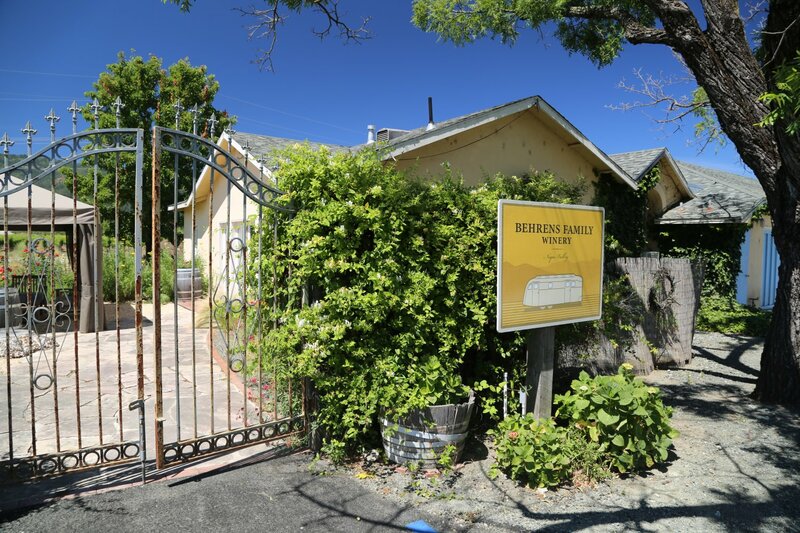 The ‘little yellow house’ is available for tastings by appointment; it is located next to one of St. Helena’s most auspicious and well-known vineyards – Dr. Crane. Despite being so close to Highway 29 this is actually quite a relaxing place to sit and enjoy wine either inside their tiny tasting salon or outside in their small patio area.